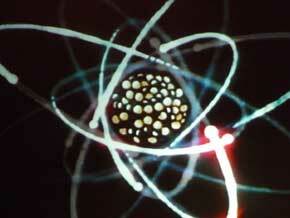 A quantum particle can exist in two places at the same time and move effortlessly from one dimension to another. Or at least this is what the Physicists tell us, and why not agree? The Poet and the Physicist meet at the top of the Mountain of Awareness. They see the big picture in all things; they simply climb that mountain in different fashion, wearing different gear. For me, I would delight in being a quantum particle as I could not only move from one location on Planet Earth to another effortlessly and leave the arduousness of jet travel behind, but also as a Painter I could move from one dimension to another … I could visit locations around the world in less than a snap of the fingers; in no time at all really — because I would already essentially be there. A Painter like me with a fast brush and a fast mind would profit much from being a quantum particle. I would enjoy visiting other artists around the world and around the universe and why not expand the range of travel and see what they are doing on this planet and others … and then zip back to my studio to share that energy and pull it into my paintings. A painting is always in movement. What keeps the collector interested and intrigued by a painting is this continuous energy. Whether looking at a painting from the time of Christ, the 18th century or the current age, all paintings are in movement! Whether a painting is being viewed by a collector or museum goer or museum curator, they will invariably see different things each time they pass the same painting in question. Those changes in perception will be affected by time of day, mood, energy levels, levels of concentration, two shots of whiskey vs. three and and a nearly endless list of affecting factors. The point is that the painting is not fixed, as nothing is truly fixed on this beautiful gem of a rotating blue planet that we inhabit. In my work forms move from one location to another on the canvas until they find their temporary home. A painter needs to be sensitive not only to the forms they are painting but also to where they are located. Each part of a painting speaks to every other part of the painting. The space between forms — whether those forms are recognizable or not — is as important as the forms themselves. The space between the stars speaks to those stars as light travels across vast stretches of space, vaster than we humans can comprehend. Komarin as a quantum particle could navigate those vast reaches of space, stopping here, staying there, a journey which may already be taking place though we don’t yet know it.